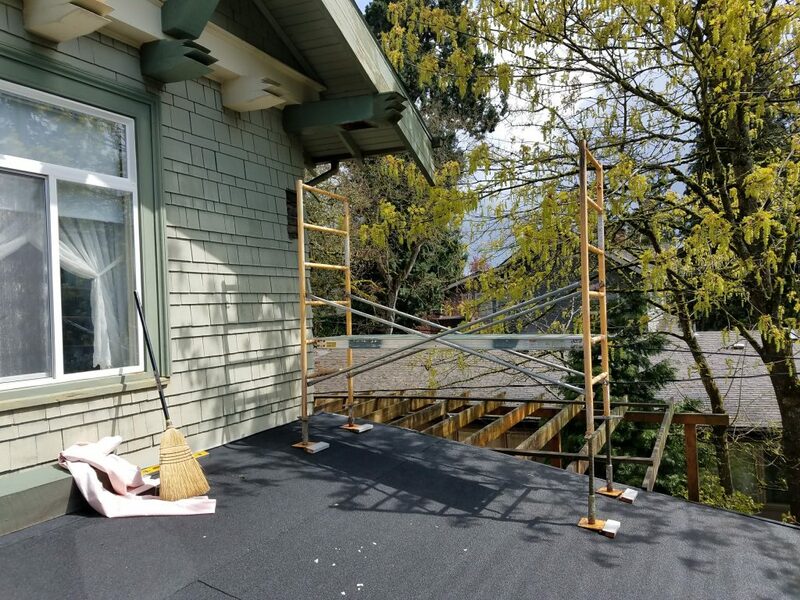 In the Pacific Northwest, the damage to your home from the elements and pests cannot be underestimated. 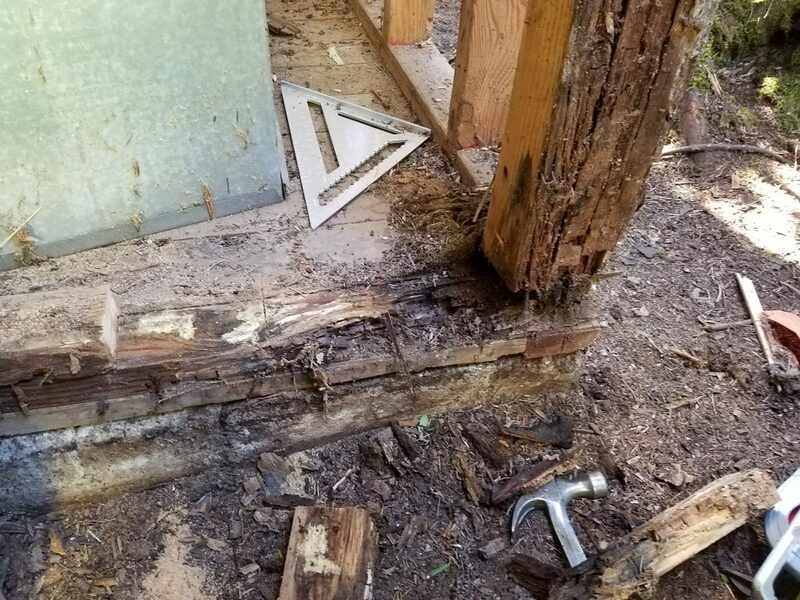 This Milwaukie, Oregon home had extensive damage from Wood Boring beetles, Carpenter Ants, and Dry Rot — this trifecta caused extensive home exterior damage. 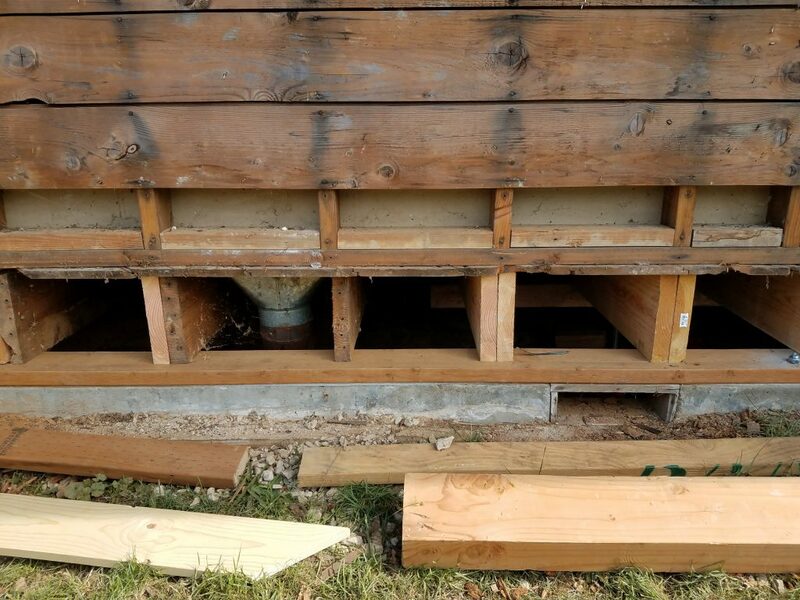 Bragg Construction arrived on the scene to completely reconstruct one entire end of the house after it had dropped approximately 2 inches due to the hollowed floor joists. The home was a one-level ranch house with a brick facade with faulty drip flashing. To understand more about the downward spiral of water damage please read this previous blog post. Encouraged by the intrusion of water, some villainous insects had clearly caused damage. Research was done to determine the presence of both Carpenter Ants and Wood Boring Beetles. To learn more about Wood Boring Beetles please check out the OSU insect identification page. 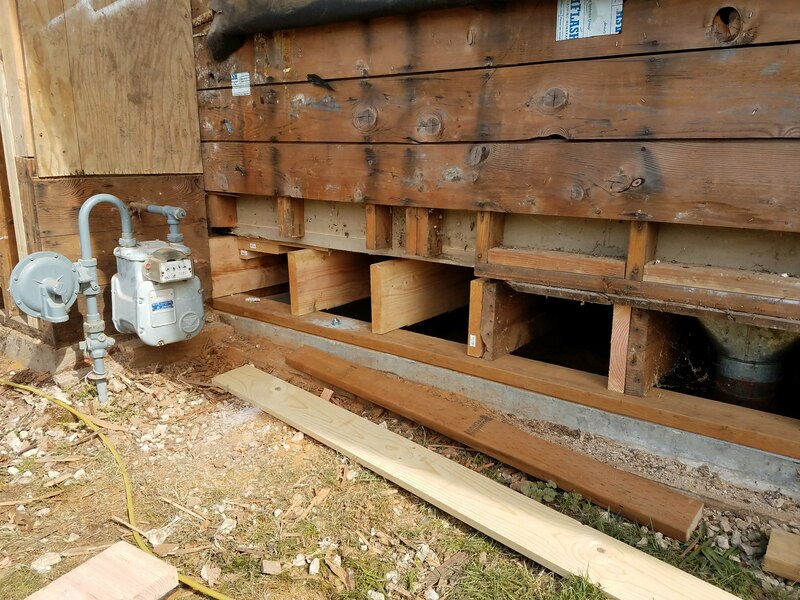 Navigating the crawl space and inspecting the floor framing, we determined at least 6 floor joist were nearly completely hollowed. 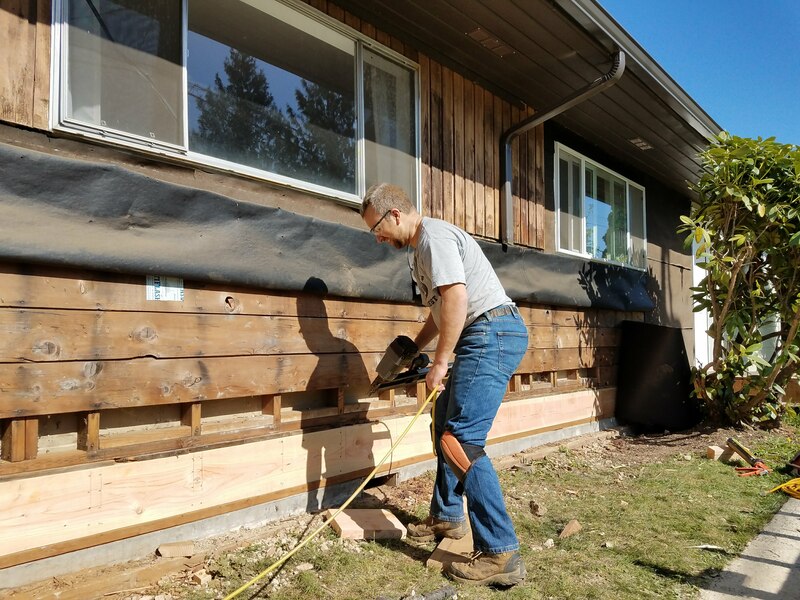 A pocket-knife went through a 2 inch thick timber, wood powder came raining down, and it was time to remove the exterior siding to get started with the replacement of the floor timbers! Bragg Construction jacked the house up in order to remove the joists. Again, the Boring Beetles had done extensive damage, notice all of the holes in the joists. 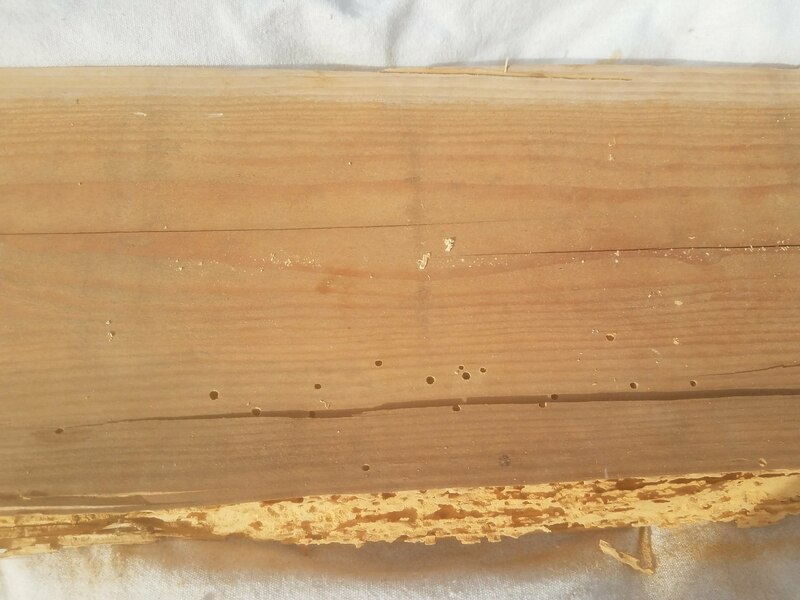 Close-up of wood with Wood Boring Beetles exist holes in fir floor joist. 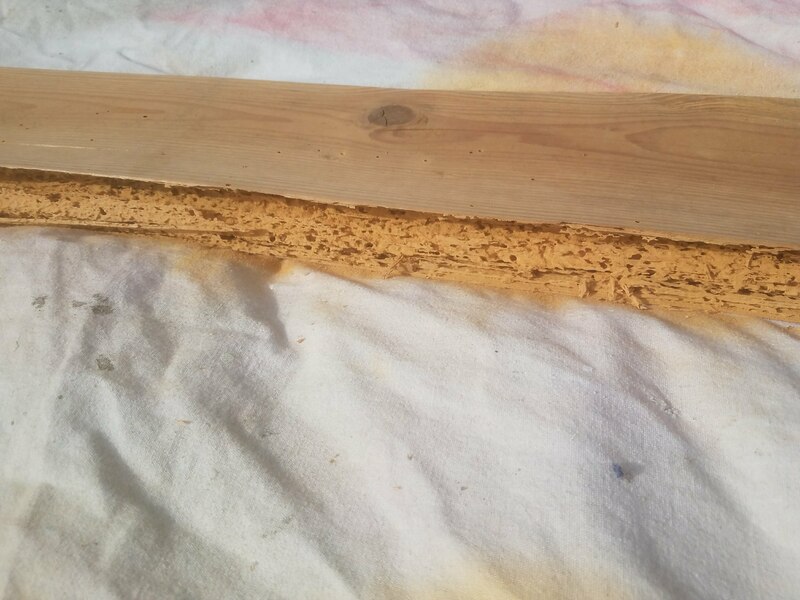 The core of the wood was hollow. The exterminator came in prior to Bragg Construction coming in to do the repairs. 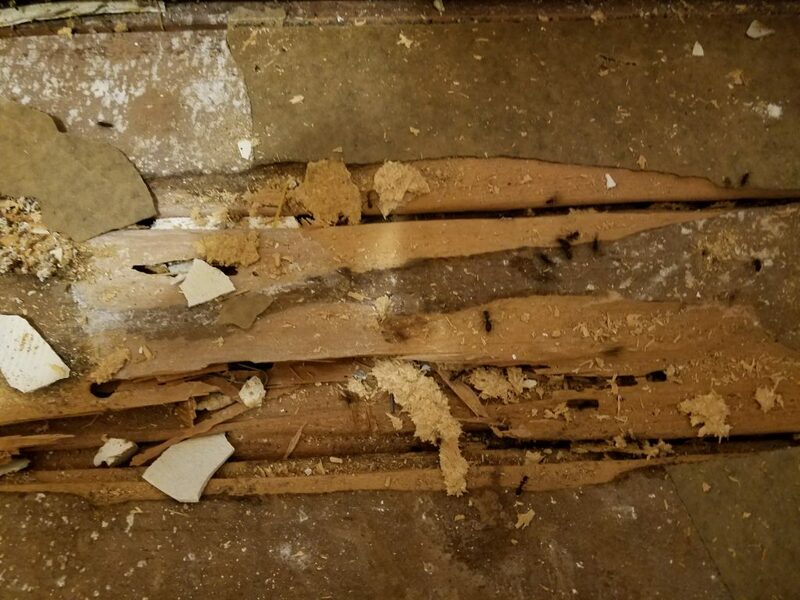 Shreds and powder are all that remains of this floor joist removed due to Wood Boring Beetle damage. Bragg Construction inserted 4 full length 12′ floor joists. 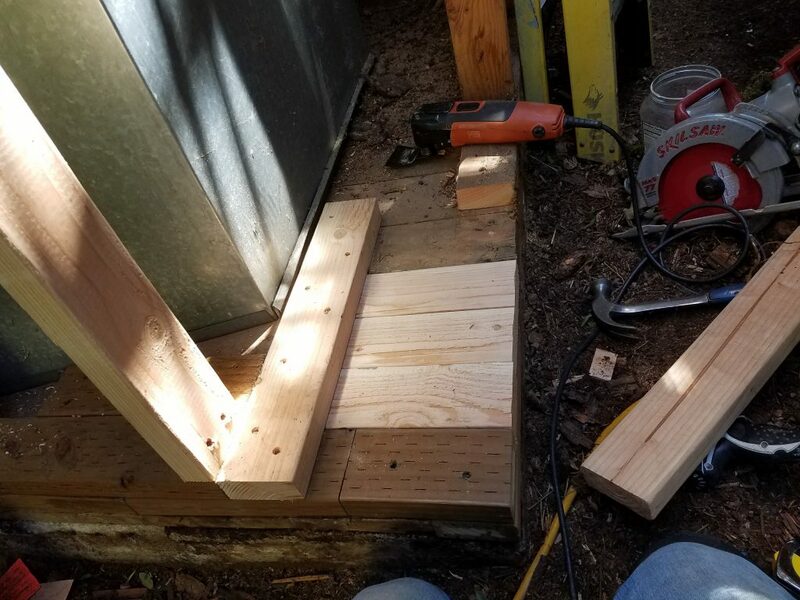 View of the 4 new 12′ lumber floor joists. Rim band goes into place to complete the repair. 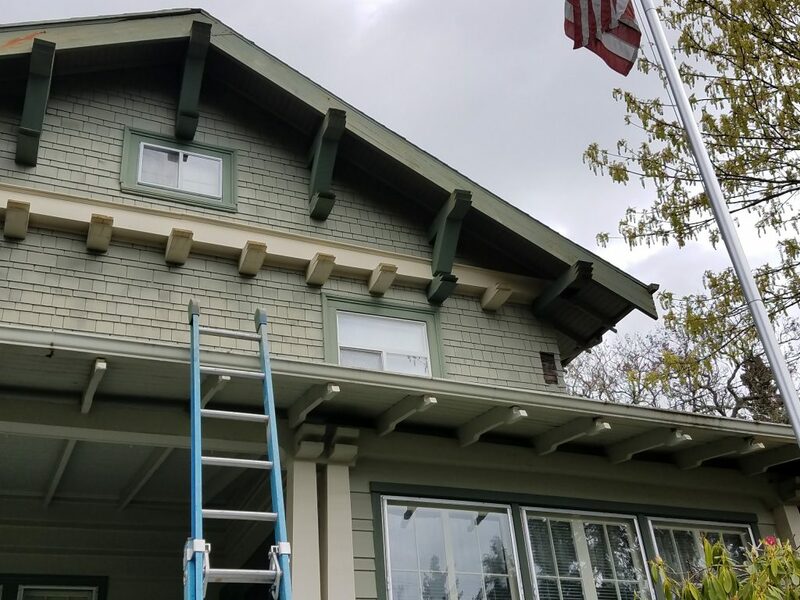 This beautiful home in Portland’s Alameda neighborhood had a knee brace fall off due to poor attachment and dry rot. The pieces that fell weren’t badly rotted so they did not need to be rebuilt, only reattached. 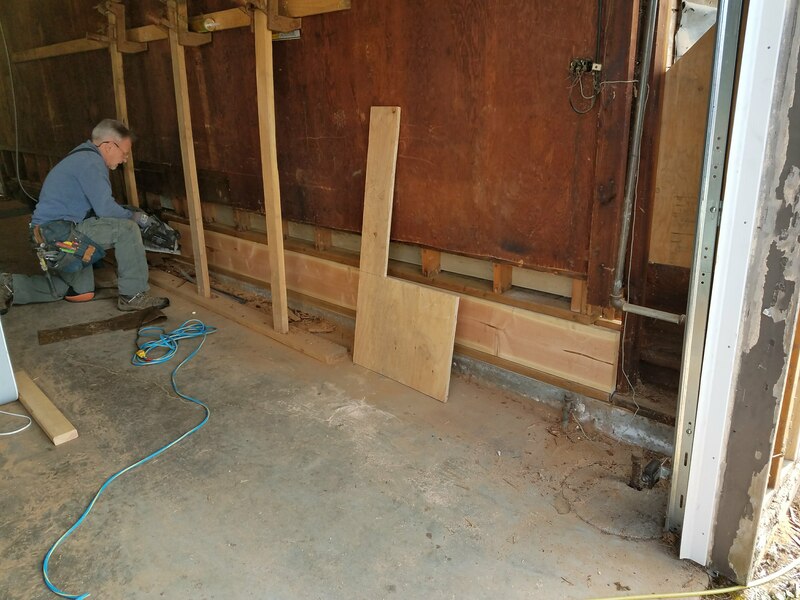 Here is the process of historic home repair as performed by Bragg Construction and Remodeling. 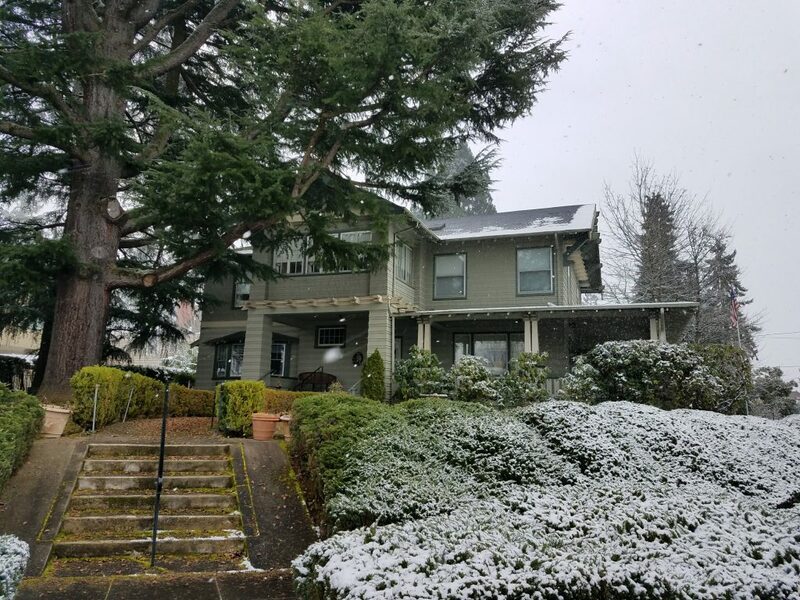 Beautiful home in Portland’s Historic Alameda Neighborhood. A knee brace holds up the edge of the roof. (The dark green things). The wide board here is known as a “barge board” Notice the beautiful detailing! Wonderful architectural details on this Historic home in Portland’s Alameda neighborhood. Notice the missing knee brace, upper right corner of photo. 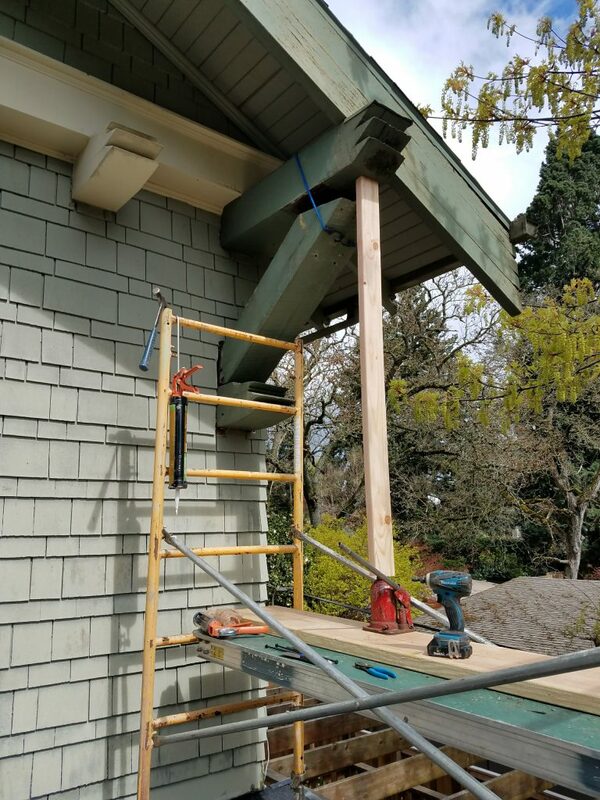 Bragg Construction sets up ladder to get to the dry rot portion above the porch roof. 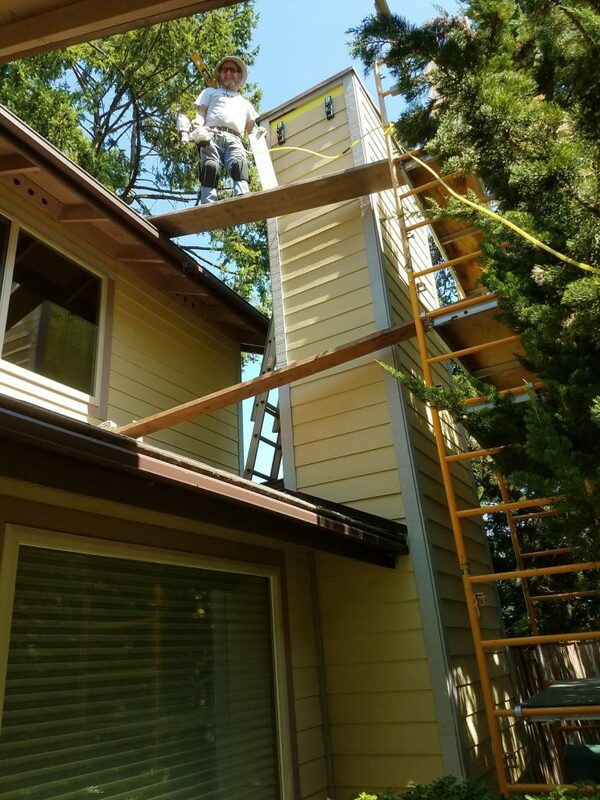 Bragg Construction and Remodeling creates safe work platforms for efficient working. Scaffolding set up with adjustable feet on sloped porch roof. The diagonal part of the knee brace has been drilled and glued ready to lift into position. Scaffolding is used to assist in holding the knee brace. 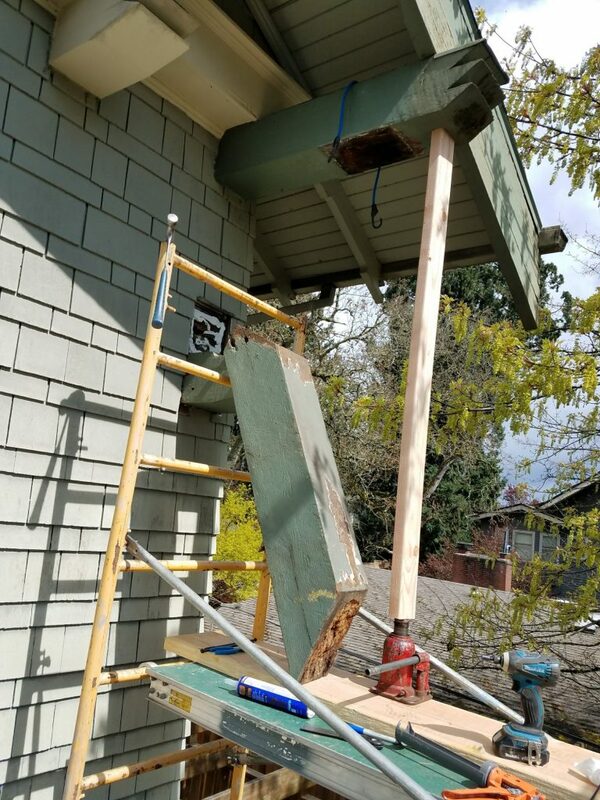 The scaffolding holds the craftsman, tools and provides a platform for the house jack. A one inch lift is accomplished so that the restoration is Perfect. The diagonal portion of the knee brace is placed and ready for the roof to be lifted. What are we doing with the Bungie Cord? The carpenter makes the final lift while attaching with long screws and glue. The bungie simply provides a “helping hand”. Diagonal brace is temporarily held up by the scaffolding and the bungie. All that is needed now is painting and regular maintenance. Repaired right knee brace, caulked and ready for paint! Historic Home Repair… The house is healed! Historic home preservation takes care and skill. 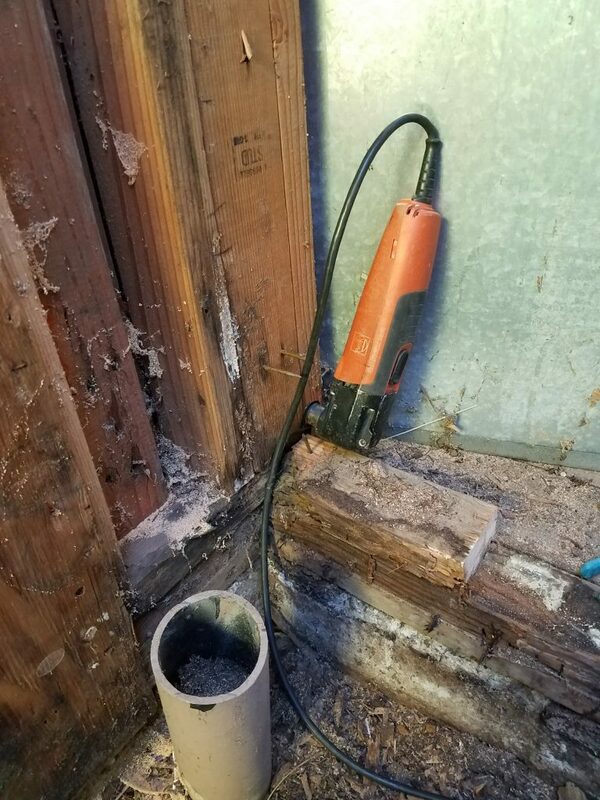 Water damage causes dry rot. 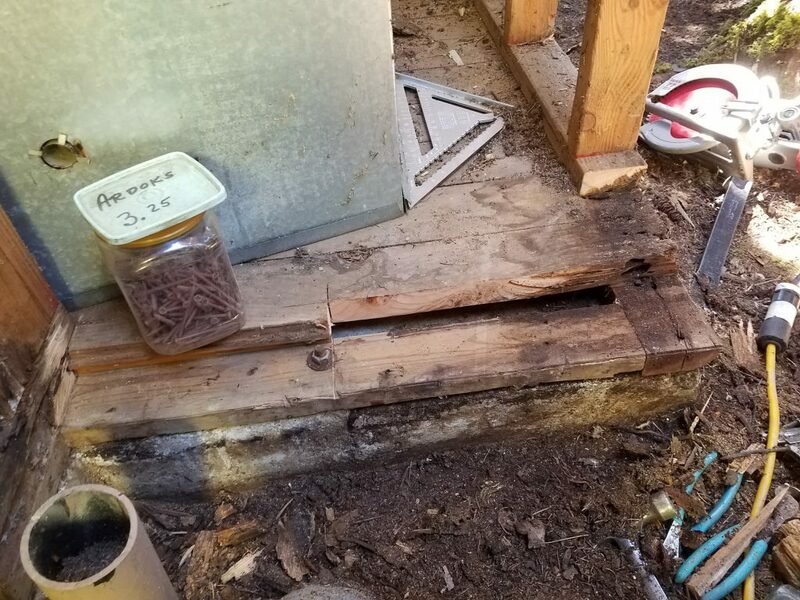 Dry rot is an invitation to Carpenter Ants. Once you’ve got Carpenter Ants eating away at your home you’ve got trouble. The downward spiral continues to feed the dry rot and colony of Carpenter Ants. Carpenter Ants can do thousands of dollars of damage to your home. They eat wood to make room to build their nests which weakens the structure of your home. 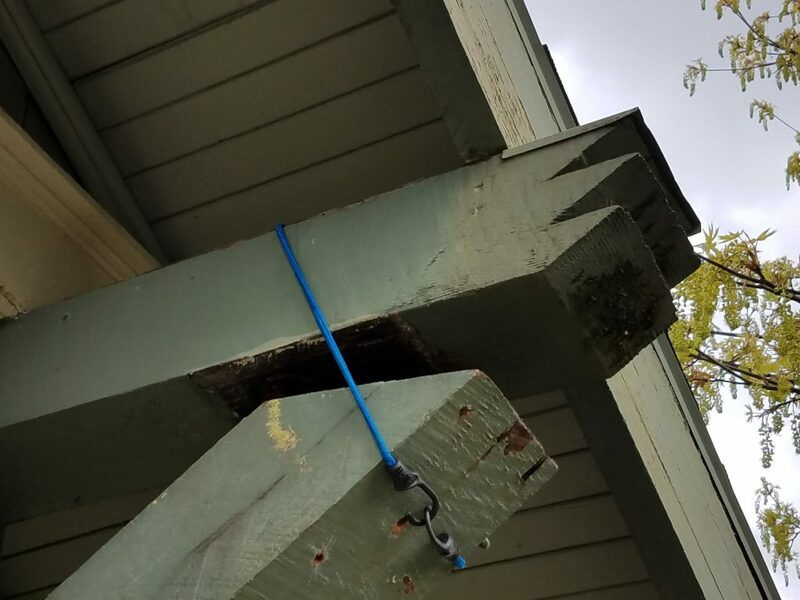 You’ve got to remove the dry rot to get rid of the Carpenter Ants. One of the most common places for dry rot to start in your home is near Kitchen and Bathroom fixtures. Often a very small leak will begin the downward spiral. 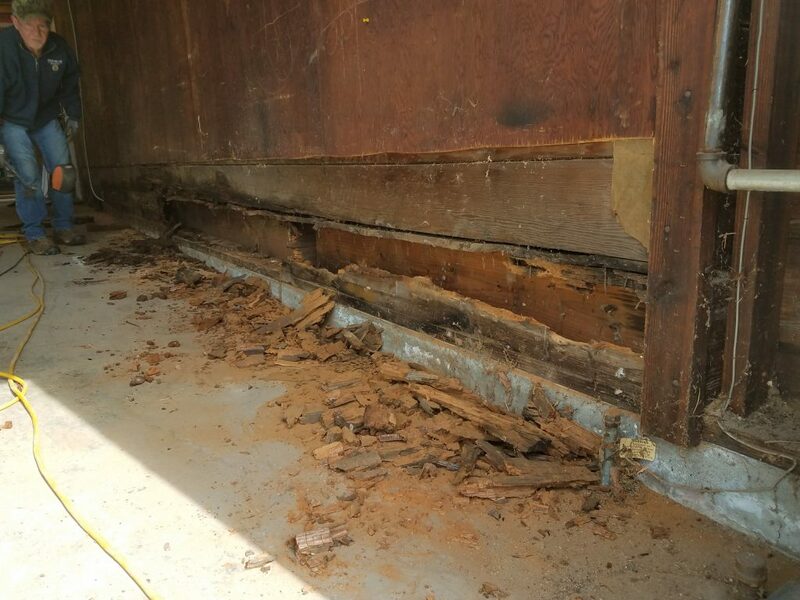 The only good news about dry rot and Carpenter ant damage is the opportunity to get a new floor. In an older home it may already be time for a new floor so . . let the work begin. 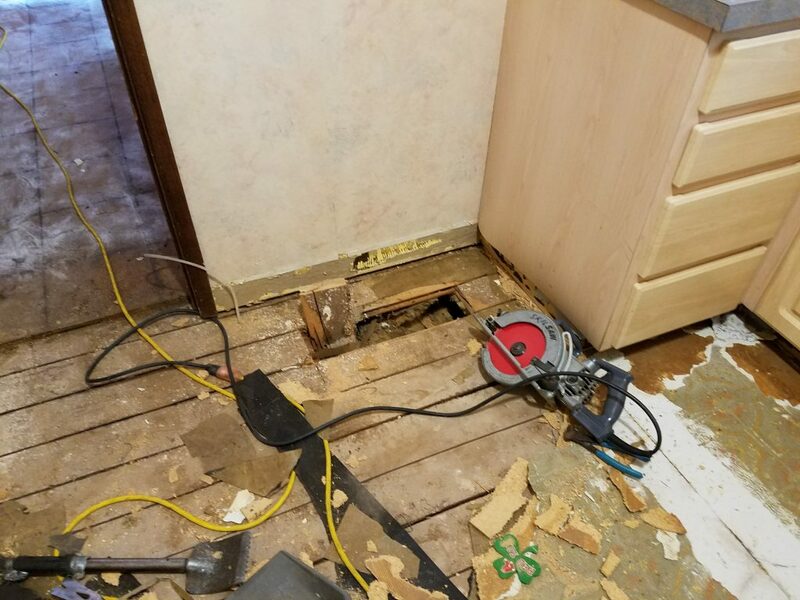 First the old floor must be removed to expose the sub floor and the extent of the damage. 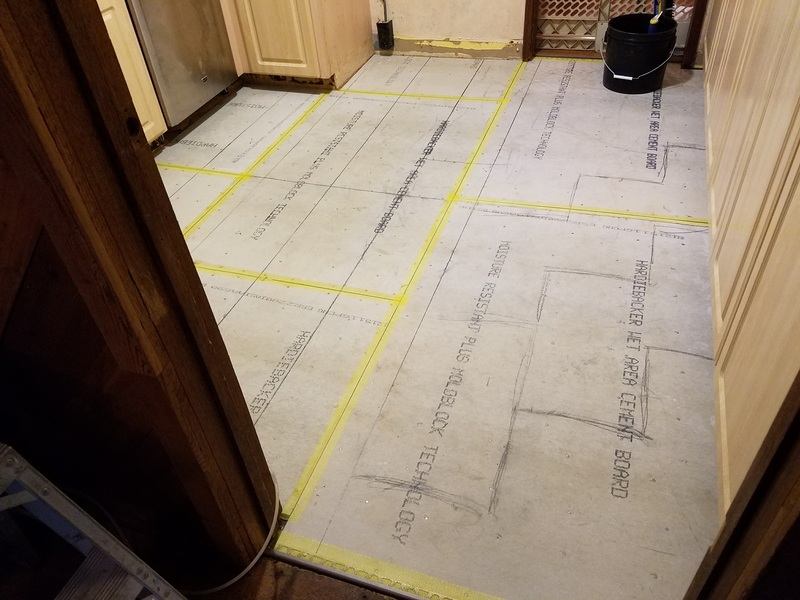 This project had an ugly vinyl floor with a chip board, (particle board sub floor). 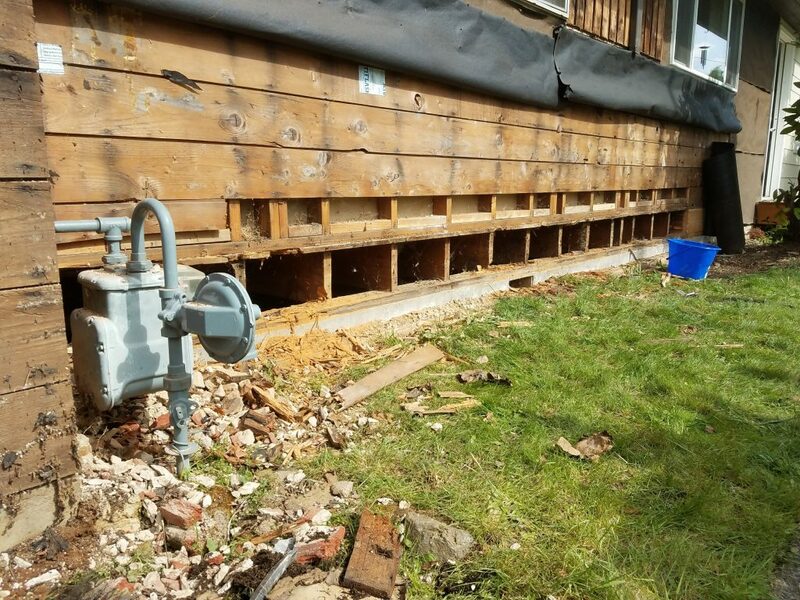 Another bit of good news on this project is that the carpenter and and dry rot damage was only about 2 square feet. Since this was an active nest an exterminator was brought in to destroy the ants. Bragg Construction and Remodeling builds Tile floors to last. Tile Floors are very durable if built on top of a cement sub floor. We glue the cement floor to the sub floor and nail with ring shank nails. Notice the pencil lines with a suggested lay out for the 1 x 2 tiles. The skills of the Master carpenter are also useful in the installation of tile. 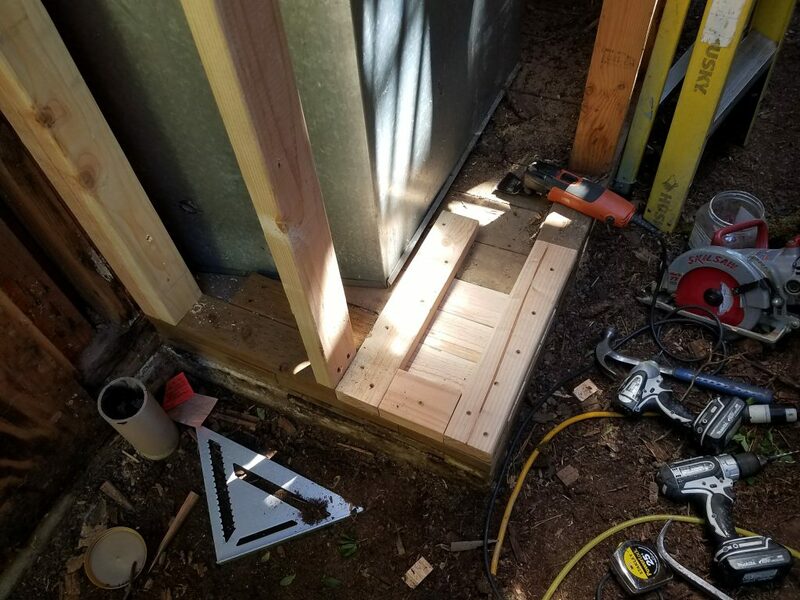 Notice the professional product: Undercut door jambs and casings, Good layout, and Straight lines make for a professional installation. 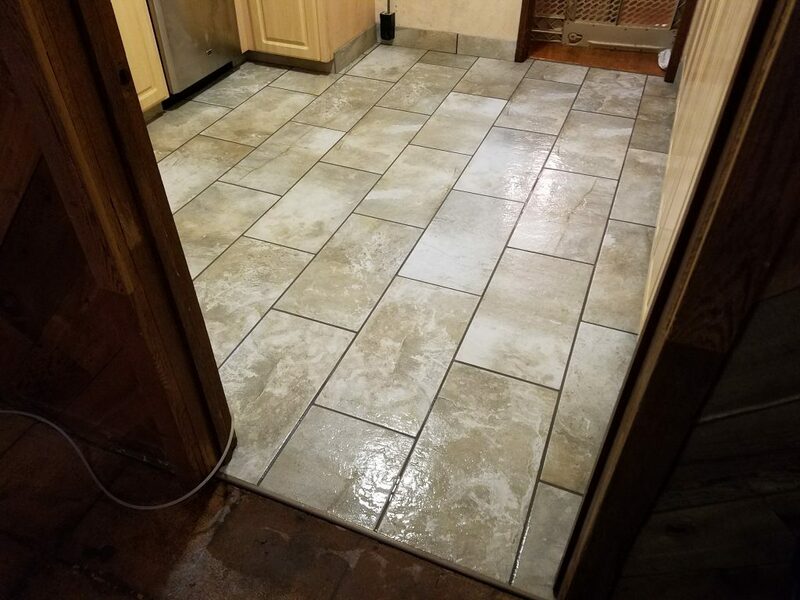 The best choice for Laundry rooms, bathrooms and some kitchens is a quality, professionally installed, tile floor. 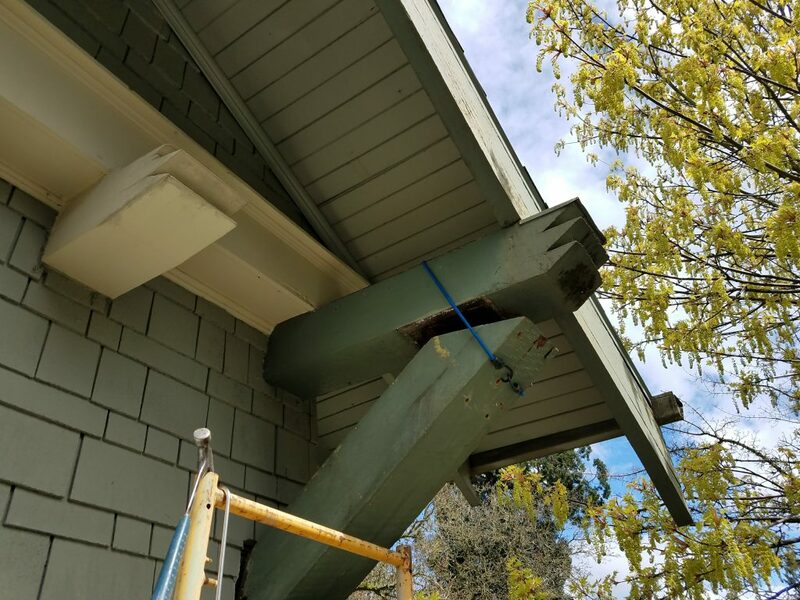 Bragg Construction was recently called out to a home in Milwaukie, Oregon to repair dry rot and reside the home exterior. 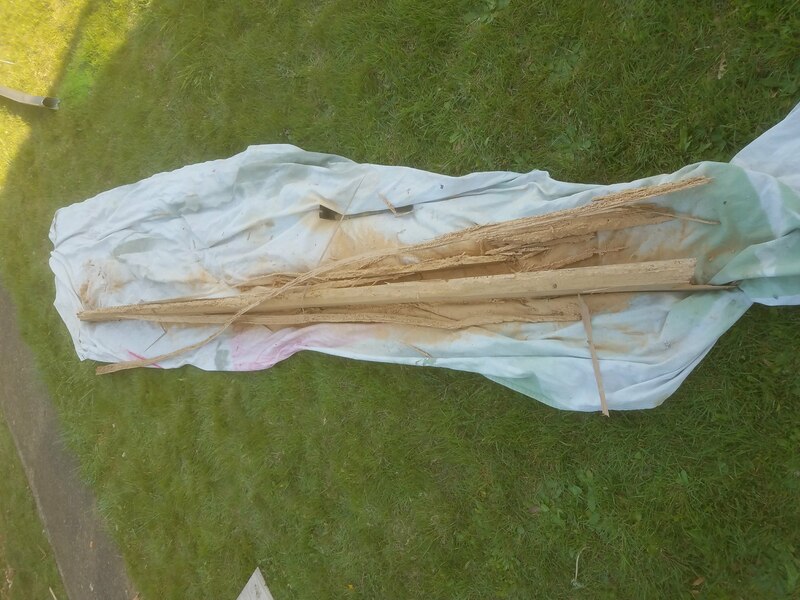 Upon arrival the dry rot was so severe that in was obvious that dry rot repair needed to be done before new siding could be installed and new paint could be applied. Faulty flashing around the chimney chase had allowed years of water intrusion to cause damage to the siding, sheathing, and framing. This home had what is called by some as “double wall construction”. What that means is that there is a layer of standard plywood on the outside of the wall studs. Felt paper was then applied to the plywood “sheathing”. Over the top of the tar paper a layer of cedar siding was applied. 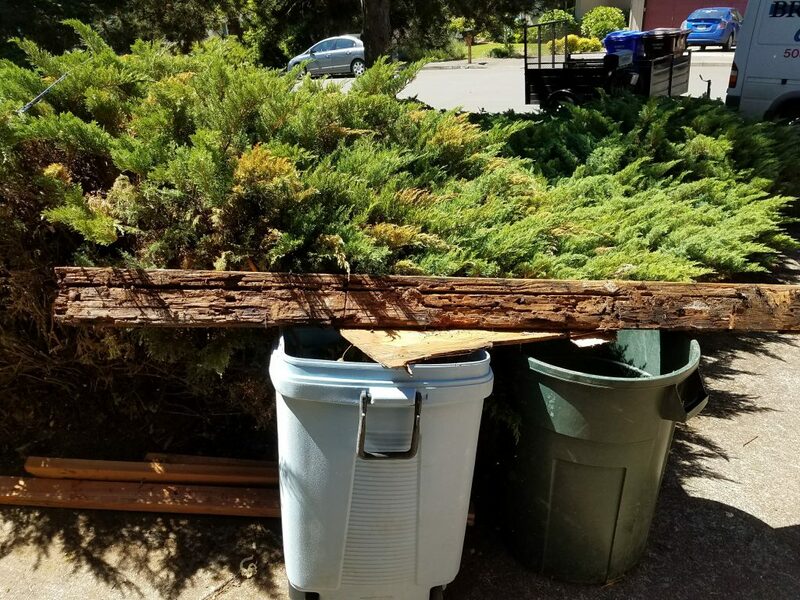 ALL of these items were rotten and deteriorated and had to be removed. About 6 wall studs had dry rot that must be removed. Dry rot is a fungus that destroys wood. Dry rot must be removed and replaced. Careful removal of wall studs, (which hold up the house), are removed and replaced a few at a time. Knowing how a house is built is useful knowledge when disassembling and rebuilding. 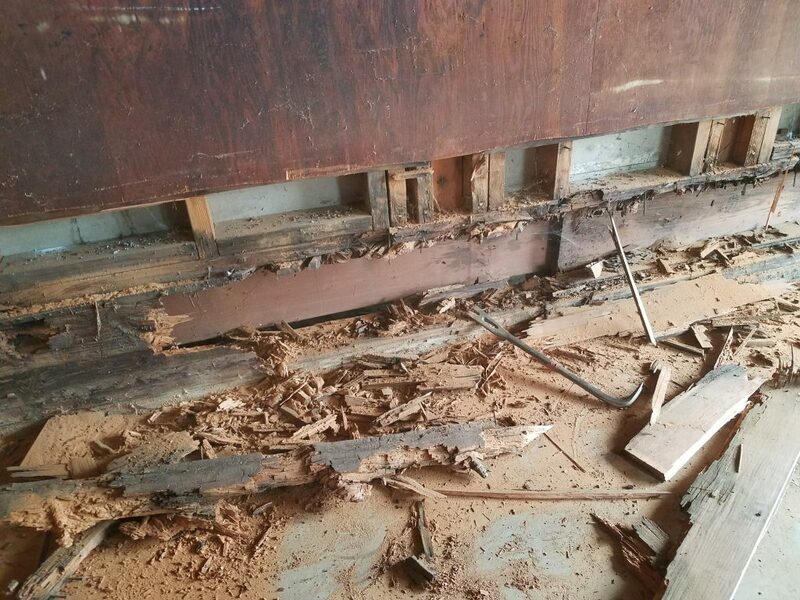 A lot of dry rot removal is more than just surface repair. 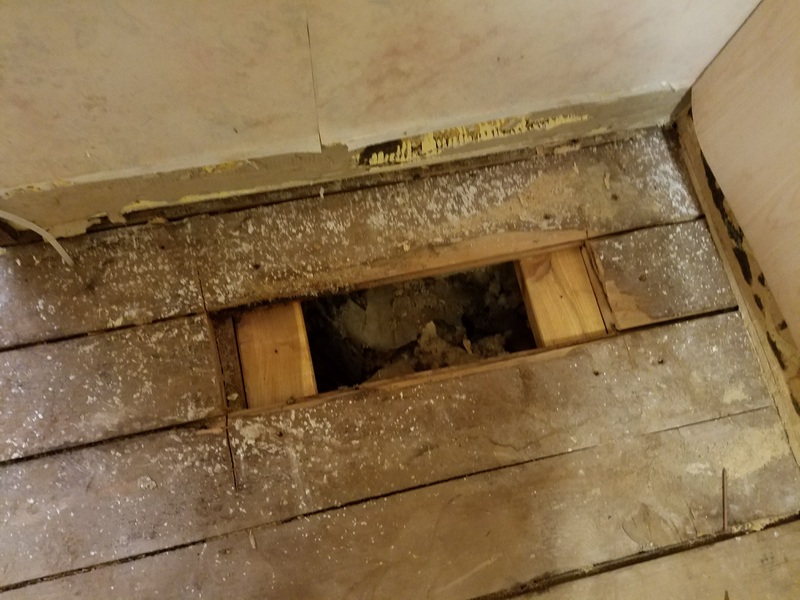 Wall studs, top and bottom plate and even portions of the sub flooring are carved out in a logical and careful way and replaced. New plywood sheathing is cut fitted and nailed. A new “Improved vapor barrier” is installed. This home is now ready for new siding and paint. Cedar or cement siding are 2 good options for siding. 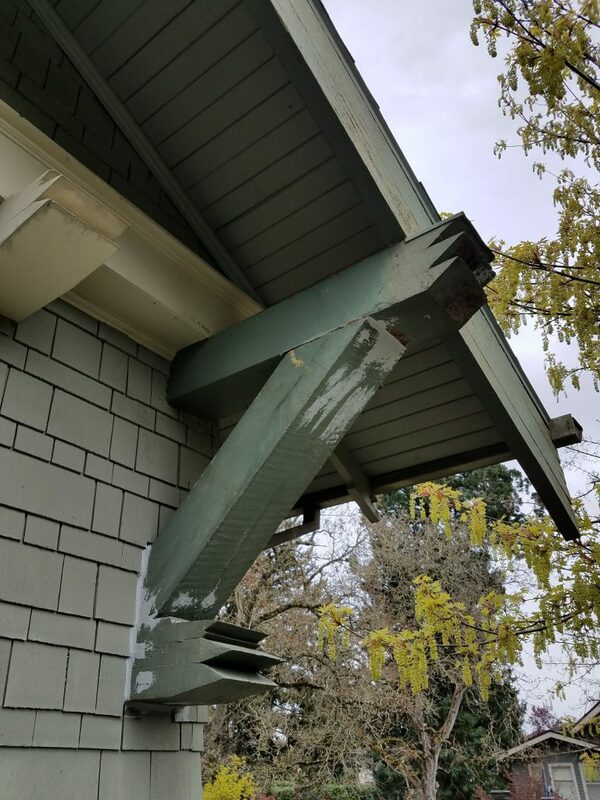 Both options will last a long time if properly maintained with caulking and Paint. Bragg Construction and Remodeling does multi-trade projects. 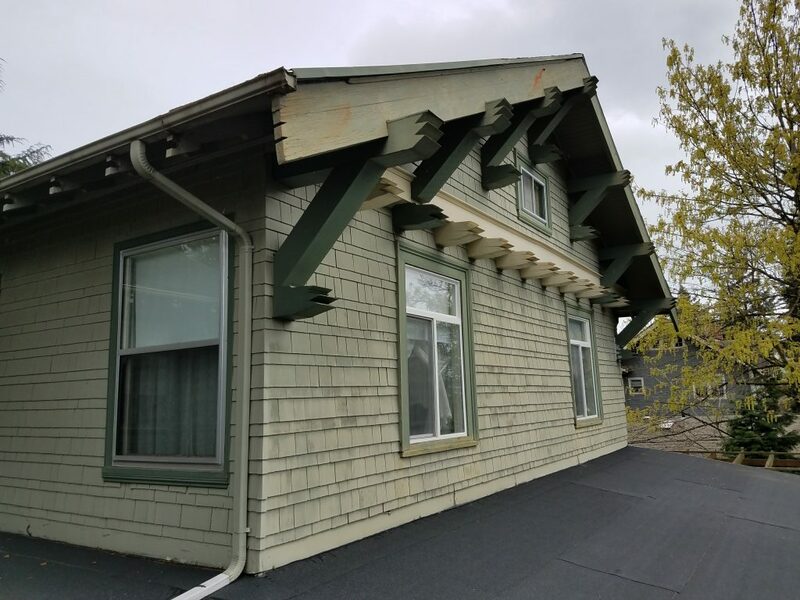 On this home we repaired a large amount of dry rot, repaired framing, installed plywood sheathing, “improved Vapor barrier”, lap siding, caulking and paint. Dry rot repair is complete. We are a full service remodeling and repair company. We specialize in highly skilled multi-trade projects. We love what we do. We concentrate on job completion and cleanliness. We treat your home and pets with respect. We do a wide variety of projects including small repair jobs, additions and large, whole house remodeling. © 2019 Bragg Construction. All Rights Reserved.